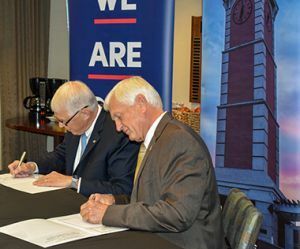 The articulation agreement was signed Friday, Oct. 19, at Pensacola State by President Ed Meadows and USA President Tony Waldrop. The collaborative program between the university and community and state colleges creates a seamless transition to USA for transfer students who earn their associate’s degree. Pensacola State is the first Florida College System institution to join the program. The academic partnership enables more PSC graduates to transfer to USA and earn their bachelor’s degrees. South currently enjoys similar partnerships with Coastal Alabama Community College, Bishop State Community College and Mississippi Gulf Coast Community College. “Pathway USA’s agreement with Pensacola State College takes effect immediately and is geared toward students who are not admitted at USA as well as students who may simply prefer to begin their college education at PSC,” Meadows said. Students may choose to have a copy of their USA application and supporting documents forwarded to PSC for admission consideration. Students already attending PSC also can apply for Pathway USA. A unique application will be created and available for PSC students to complete and submit. Complimentary admission to South Alabama home athletic events.